grandma's cookie jar: Today is, "Won't You Be My Neighbor Day"
As grandmas (or grandpas and parents, too) we want to influence the children we love. We want to hand down the faith and we want to help them grow to be kind, treat others with gentleness and learn to make wise choices, because we know if they do, they will live much fuller lives and because we love them. 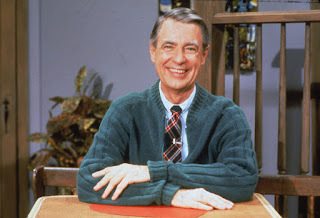 Well, today is, "Won't You Be My Neighbor Day" which, according to daysoftheyear.com is; "a day to remember and honor Fred Rogers, the iconic children’s TV presenter of Mr. Roger’s Neighborhood. His show reached it’s heyday in popularity back in the 1970’s and 80’s, and repeats are still able to be seen today. Gentle, soft-spoken Mr. Rogers was a mainstay for preschoolers and their parents; teaching them respect of those around you and a good attitude were just as important as learning your colors and letters." God brings into their lives. Your influence in their lives matters. to influence them to do the same. someone who will go on to impact and influence millions! day - and influence your grandchildren to do the same!